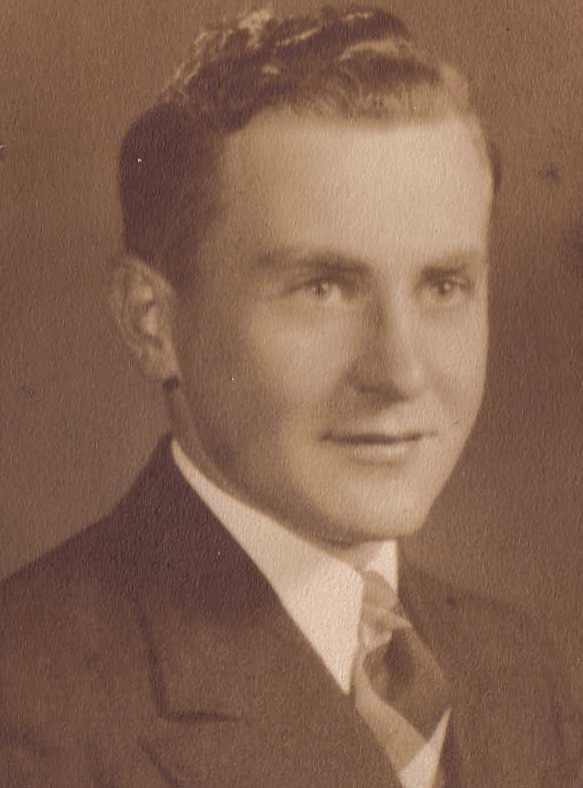 The youngest of Wesley and Bessie Reed Pearce’s children was born September 15, 1918 in the Pine Creek valley settlement in Allegheny County, Pennsylvania. He was named Dale, meaning “a person who lives near a valley or vale.” I know of no other Pearces or Austens who have this name. His middle name, Nelson, on the other hand, was his grandmother’s maiden name. Probably reaching back to the British Admiral Lord Nelson, who was victorious at Trafalgar, the name Nelson appears in the Pearce line even before with Richard Pearce, Jr. (1824-1897), Grandfather Charles’ older brother and Richard and Susan Austen Pearce’s sixth child, who married Mary Nelson in 1856. This was three years before Dale’s Grandfather Charles married Permelia Nelson. Mary was probably from Illinois because their address was Flora, Ill., but were Mary and Grandmother Permelia related? Another irony is that Mary and Richard’s oldest daughter, Utica, married Nelson Johnson. But, back to our story. Dale, just a year younger than his brother Ralph, appears in the all the school pictures with him. Whereas Ralph has his head bowed slightly and has black hair, Dale appears confident, with a smile and light hair. Dale was just 9 years old when the family farm went to Allegheny County for a new park under the right of eminent domain. Like his brother Ralph, Dale did very well in the new Mars school system. But while Ralph chose a job with the local telephone company, Dale went off to college at Slippery Rock in 1936. The state college is just north of Butler, the county seat. His future wife, Helen Andre was admitted two years later, and they met in a Sunday school class there. On the first date they went to a movie about the Pittsburgh-born composer of 19th century popular music, Stephen Foster. This seemed to set the happy tone for their life together. After graduation, Dale accepted a teaching job in Hopewell Township, Beaver County, well within driving distance from both Slippery Rock and his home. But, within a year he was drafted into the Army with the United States anticipating world war. He served in the 82nd Airborne Division of the 376th Bombardier Group. His tour of duty overseas included time in India, Egypt, Tunisia, and Italy. Before he left for 26 months overseas, he asked Helen to marry him. Helen taught in Brackenridge Schools near her home in Natrona Heights, overlooking the Allegheny River, from 1942-45 and studied at Duke University for a Masters degree the summer of 1944. 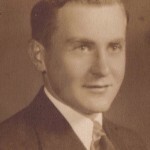 Two weeks after Dale returned home on a thirty-day leave, on May 12, 1945, the couple was married at Grace Methodist Church in Natrona Heights. Helen left her teaching job right before the wedding with only two weeks of school left. Her principal simply couldn’t understand. They traveled by train from Pittsburgh to New York City on their honeymoon. They stayed at the Henry Hudson Hotel, went to Radio City Music Hall to see the famous Rockettes, and visited the Statue of Liberty, Ellis Island, and the Empire State Building. They also saw their first television show while in New York City. After the honeymoon, Dale returned to the Army. Helen took a train all by herself to Grand Island, Nebraska to be with him. Dale was finally discharged from the service in July. The two returned to the family farm near Mars for the summer. Dale accepted a contract with Grove City Schools, just north of Slippery Rock, in August to teach seventh and eighth grade math. The couple moved into a furnished apartment as the school year began in 1945. The following February, they paid $6,000 for a two-story frame house at 608 Spring Street in Grove City. They used money they each had saved for the down payment, and they paid $75 to relatives of neighbors across the street for a set of used furniture that included a table and chairs and a buffet with china cabinet [son Tom in Texas still has this cabinet]. Two months later, their first of four boys was born, Ronald Allen. A year later Lee Nelson [there’s that name again] was delivered. The family remembers that that was the night a bat found its way into the house. Perhaps Lee’s birth was induced? James Clyde [both very popular Pearce names, but in this case after his maternal grandfather James Clyde Andre] came in 1952, and Thomas Dale was born in 1956. Added to the earlier irony of names and relations is that Dale married Helen Valera Andre (1920-2001), technically a cousin through marriage. Helen was the niece of Urban Ambrose Andre, who was Dale’s 1st cousin through his marriage to Dale’s Aunt Permelia McKelvy’s daughter, Minnie. If you’re counting, that makes them second cousins by marriage, or biologically not related, I think. While Helen managed the home, Dale rose from elementary teacher to elementary school principal to assistant school superintendent and finally to school superintendent. For years, during summers, evenings, and weekends he did graduate work at Penn State University and Westminster College to complete the certifications necessary to advance his career. After 29 years with the Grove City School District he retired on June 30, 1974. The Mohawk School District recruited him out of retirement in September of that same year to be the “interim” or “acting” superintendent to fill an unexpected vacancy. He was offered the position as the Mohawk School District Superintendent on a full time basis with a five-year contract in July of 1975. After 30 years at the same address in Grove City, the couple moved to Wilmington Road in busy New Castle, PA, that summer. Tragically, Dale developed a fast-growing form of cancer and died unexpectedly less than 6 years later at the age of 62. When the end came, he was surrounded by family and friends. Helen died even more unexpectedly this past March at age 80 of a stroke. Active until the end, having been to South Africa, England, Ireland, Wales, Australia, New Zealand, China [twice] and all over the United States, she left her world of family and friends in disbelief. They were both active Presbyterians but stayed connected to their Methodist roots through an annual Easter weekend Andre Family Reunion at the Jumonville Training Center near Uniontown, PA. This included having the family get together for food, fellowship, and service to the camp. To our family, Dale and Helen were always the perfect couple, the ideal combination of intelligence and civility. They seemed to always regard each other with respect, while their children used the manners seen on “The Nelsons” [the name again?] or “Father Knows Best.” My brothers and sisters couldn’t seem to act that way, even in public. Uncle Dale had the education and position that we so greatly admired. Although Aunt Helen also had the academic degree, she was most respected for her compassion and kindness. Because of the closeness of my father and his brother, our families spent a lot of time together, despite the physical distance between our homes. When I was six years old, I stayed with them after I had my tonsils removed at the Grove City Hospital. Several times I spent a week during the summers with them, and it was just like camp: riding bikes, swimming at the pool, learning various sports. During and after college I sought the opinions of my aunt and uncle on personal and professional matters. Aunt Helen and I exchanged birthday and Christmas cards regularly until her passing this year. Everyone considered Uncle Dale the Pearce family historian. He was the leader of the annual reunion, which disbanded shortly after his death. He insisted that the event be held at least 50 times [1926 – 81 with years off during the War], and it was. He understood the importance of our unique Pearce Family Narrative [see earliest articles]. With these stories, I’m attempting to take up where he left off. I believe that he would approve of their style and substance, because he thought that family heritage was important and that education should be fun and interesting.